Remember that time in 2019 when we were going to have a St Patrick's Day party and beer tasting competition and potluck? Did you find a great beer and plan your food to bring? Well, you're in luck! The 16th annual beer tasting and competition will take place on Saturday, April 13th, starting at 4:00 pm, just one month later than planned. You do not have to compete in the tasting to attend, of course, and can simply enjoy the potluck and visiting. The St Patrick's decorations have come down, so there's no real dress code, but feel free to wear the green if you wish. Here's a reminder of the evening's timing. If you are competing, please arrive by 4:30 pm and bring 4-6 bottles of your entry. The tasting will begin at 5:00 pm. All types of beer, hard cider, malt beverage, near beer, maltini, non-alcoholic beer or malternative are welcome. You can even enter a soda if you'd like to, as you never know what will win. Keep in mind that the Bad Beer Board is also up for grabs. The part is also a potluck and the buffet will open at 5:00 pm. People who are tasting beer should eat a lot, so please bring a dish to share. Jack and I will provide soda and there is always beer left over, but if you want anything else to drink please bring it along. if you need directions or want to discuss your food or beverage offerings. Here's a last-minute event that was announced at the March 10th meeting: the USS Nokomis will be attending a bout of the North Star Roller Derby on Saturday March 31st at 6:00 pm at the Warner Coliseum on the State Fairgrounds. Tickets are only $15 for admission to the beer garden, and parking is free. We need to have a list of committed ticket buyers by Tuesday March 13th. These means you are absolutely committed to paying for the tickets! Please contact either Mary Pucel or Roxanne Hill by the 13th. Doors open at 5:00. The venue has food and beverages available for purchase. Half time entertainment by 4th Curtis. There will be an after party sponsored by Can Can Wonderland. Cheers Pablo was a BLAST! Members of the Nokomis channeled their inner Picasso and enjoyed 2 hours of painting at Cheers Pablo in Woodbury on November 4th. 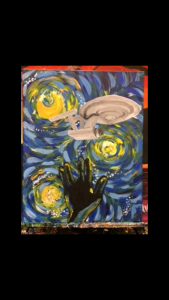 Our instructor Hannah created a painting of the Enterprise just for us, and she guided us through the painting process step-by-step. At the end of the night, there were 12 very different, creative paintings! Everyone had a great time and some even expressed interest in another painting night in the future. After our paintings had time to dry, we have a lovely meal at the Tavern Grill. Cheers Pablo on November 4th! We will be doing a paint-and-sip event at Cheers Pablo in Woodbury on Saturday, November 4th at 6:30 pm. 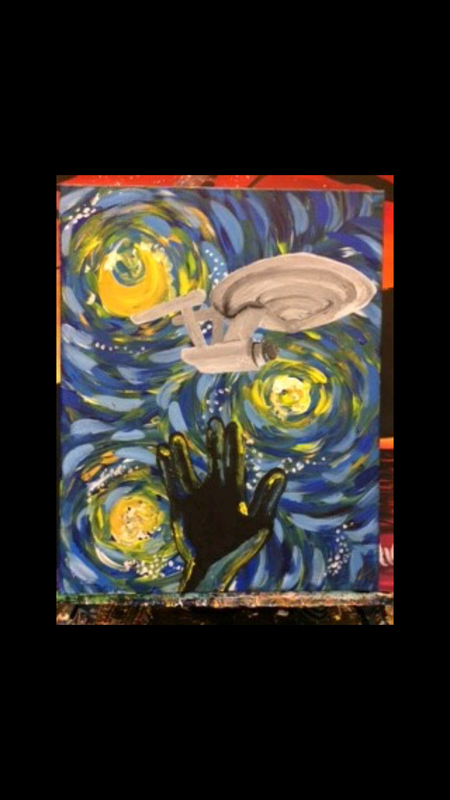 A painting with the Enterprise and a Vulcan salute has been specially designed for our group! The cost is $35 plus whatever wine or snacks you choose. You may sign up directly on http://www.cheerspablo.com Select the Woodbury location and go to our private event listed at November 4th at 6:30. Star Trek with the Minnesota Orchestra was FASCINATING! On Friday, July 14th, an away team from the Nokomis attended a showing of the 2009 movie Star Trek at Orchestra Hall with full accompaniment by the Minnesota Orchestra. Hearing the soundtrack played live was an amazing experience. Many fans who attended dressed up in Star Trek uniforms and other costumes, including the entire brass section! Many of us said we'd like to attend other types of screenings like this in the future. Many thanks to Aida Cruz for this awesome suggestion! Way to dive right in as a new member! Star Trek (2009) Complete Film with Live Orchestra! Nokomis sign-up deadline is Sunday February 19th! See the full film with Michael Giacchino's thrilling score played live to picture! The Nokomis will be purchasing a group of tickets for this concert, but we need to know if you are planning to attend! Since the Minnesota Orchestra is offering a discount to groups of 10 or more, we will be purchasing a block of tickets next week, so we need your FIRM COMMITMENT to this concert by this Sunday, February 19th. While payment will not be needed before the 19th, you will be committing to paying for a concert ticket or tickets. If you have not signed up for this event at the meeting, please contact a board member to let them know you are planning on going. Further details on payment and exact cost will be coming soon. World Defense Force will be at MarsCon…in the MUSH Room! The WDF, which are also Nokomis members, are going to be hosting a room at MarsCon this year. Our room number is 1113 -- come join us, hang out, have fun. We are bringing back everyone's favorite room, the MUSH Room, and no, it is not a fungus. It stands for the Mobile Universal Space Hospital. We are creating the Bog instead of the Swamp from the hit TV show M*A*S*H.
For those who are not familiar with us: the WDF represents all the service men and women from all science fiction shows, including King Kong and Godzilla, who die saving the planet and the human race, but you never know who they are. ). We would love your help. Otherwise, if you are attending the convention, come join us! Remember: "we all die so you don't have to." Hats and mittens (and gloves) for Hats and Mittens! Some of you may recall the Nokomis helped a charity called Hats and Mittens last year. This is a charity started by Rebecca Jorgenson Sundquist who is on my board at the National Lutheran Choir. Several other NLC members help out with this event and Karen and I attend each year. Hats and Mittens was started by Rebecca when she noticed kids at the bus stop without hats or mittens. People attending the gala bring a set of hats and mittens as a part of the admission. It doesn't stop there. Hats and Mittens also sponsors a youth-oriented organization each year. One year it was cookie cart which employs young people to give them purpose, structure, a place to go, and keep them off the street. A different group receives the donations of the gala each year. There are many worthy applications and the decision as to what group to honor is a tough one. This is a worthwhile charity. This is where you come in. Last year the Nokomis donated 31 sets of hats and mittens. The demand exceeds the supply and requests come from unexpected places such as Edina. Teen sizes are also needed. You can often find hats and mittens (or gloves as mittens are hard to find) on sale somewhere or on clearance. It doesn’t need to be fancy. Karen and I have a good start with 10 sets. Let’s see if we can break last year’s record. You can bring your contribution to the November meeting or the December Christmas party. Thanks you for your kind contributions last year and for considering helping again this year. Planning ahead for June: our 32nd Anniversary Picnic is coming up on Saturday June 11th at the home of Loren and Carol Evers, 11357 142nd St N, Stillwater, MN. The meeting will start at noon with the potluck starting around 1:30. Please bring something to share for the potluck.